I recently visited Charleston, South Carolina, and have a few recommendations there, including the Tides Folly Beach Hotel… a perfect sanctuary on the Atlantic to prepare for your cruise or unwind afterwards. Our trip to Tides Folly Beach Hotel in Charleston started off in a whirlwind as I am sure most American vacations do. I finished up a conference call on my headset while packing, loading the car and pulling out of my driveway around 3 p.m. on a Friday afternoon. I was coming from Charlotte, about three hours away. Not too long of a drive for a quick two-day vacation. We arrived in Charleston around 6:30 p.m. and decided to eat at a restaurant known for its shrimp & grits, called the Hominy Grill. The feel was very homey, with lush plants surrounding the entrance. It reminded me of downtown Savannah. We promptly ordered the Jalapeno hush puppies as an appetizer, as we were famished. The hush puppies were delicious and they were served with a side of Tabasco to enhance the spiciness of the jalapeño. For the main course I had to go with the shrimp and grits, and my girlfriend had the catfish. 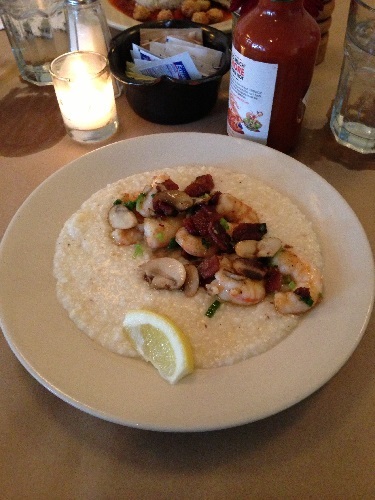 The shrimp was seasoned just right, allowing the flavor of the grits to compliment the flavor of the shellfish. The catfish was also excellent, fried to the point where it was crispy on the outside and soft on the inside. After the main course we shared the world famous chocolate pudding and can’t say enough about how delicious it was. The consistency was that of gelato with the flavor of chocolate that made my stomach smile with enlightenment as chocolate had never tasted so good. After dinner we proceeded to the Tides hotel to check in and adventure in and around our new surroundings. We arrived in Folly Beach to a barrage of cars and people lining the streets. The people in vehicles were looking for parking while the people lining the streets were all headed to the beach and pier. The village immediately reminded me of something out of the Caribbean with open deck bars and restaurants. It just had that Caribbean feel. We pulled in to Tides Folly Beach Hotel private parking lot and were happy to see parking spots aplenty as everyone not staying at the Tides was circling, waiting for someone to leave. We walked in to the lobby and were quickly greeted at the front desk. Underneath the desk in a glass enclosure was a beautiful piece of driftwood showcased like a trophy. It immediately had the beach feel and we were both very excited to check in and get to the beach just before the sun set. The room was nice with the beach home feel. Artwork of sunsets and the beach along with the lighter colors of the paint contrasted with the dark wood furniture allowing for the feeling that we had finally arrived. The room itself was cozy and homey, and the view was amazing! We were able to see the whole beach without any obstruction and there was a beautiful pier that jetted in to the ocean around 250 yards. We immediately put on our sandals and headed to the beach. It was great to feel the ocean breeze and hear the waves as we removed our sandals to feel the soft South Carolina sand. We walked toward the pier and watched the sunset as we made our way to the very end. There was a nice little party going on at the very end of the pier and we promptly showed our ID, ordered and enjoyed a 420 Sweetwater while taking in all that Folly Beach had to offer. 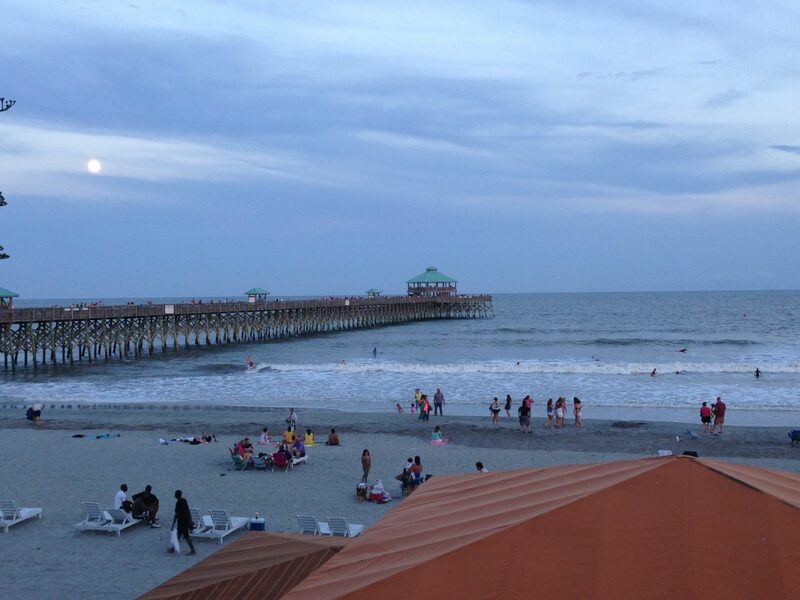 Around 9 p.m., we returned to the room to change and prepare for our adventure in to downtown Folly beach. The Tides is literally right across from the downtown area and from what I could see it was the only hotel on the water. The streets were lined with people going in and out if Bahamian style bars restaurants and gift shops. We stopped by a couple bars having a drink at each to experience the ambiance before changing our course to the next. The next day we spent most of the time at the beach before going to dinner at the in house restaurant, BLU. The décor was magnificent with twinkling colored lighting, upscale and modern furniture and a great view of the ocean. We had the seared tuna for an appetizer, which was delicious. 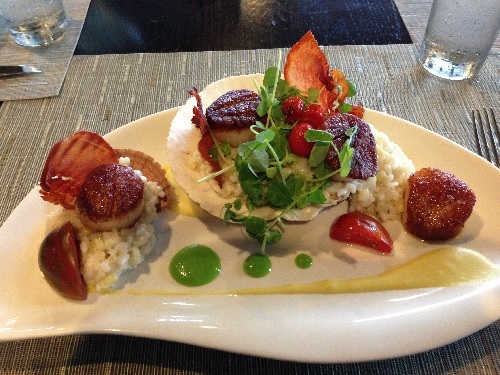 I then had the seared scallops as my main course and couldn’t have been more pleased. The staff was very friendly and provided us with first class service. 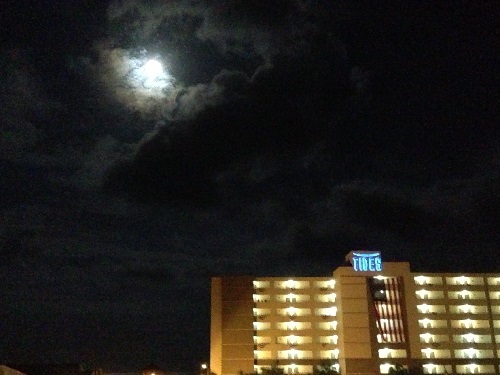 I would definitely recommend BLU if at Folly Beach and staying at Tides. The next morning we packed up and left early for our drive back to Charlotte. Once again, Tides was very conveniently located leaving us a few hours’ drive home. Tides Folly Beach Hotel is a very nice establishment, reasonably priced and a great location with very nice restaurant right inside the hotel. Nicest hotel on the beach at Folley. It’s beachfront and just minutes from historic downtown Charleston, local attractions and the best local restaurants. Amenities include a private beach, outdoor pool, great restaurant with room service, 24-hour business center, fitness center and 100% pet friendly. Guestrooms open to private, oceanfront, balconies or semi-private patios and feature cable televisions, mini-fridges and MP3 docking stations. If you are interested in staying at this hotel, for a vacation prior to or after your cruise, I highly recommend it. For more information, contact http://www.tidesfollybeach.com/ , visit www.follybeach.com or email press@AllThingsCruise.com. Had a fabulous stay for a quick weekend stay. Everyone was so polite and helpful with everything! Wonderful staff! !